Every once in a while, an aquarium livestock retailer really loads up on the goods. Such is the case for Pacific Island Aquatics, who happen to have a rather impressive smorgasbord of really rare fish at this very moment. Other than the usual offering of several Hawaiian endemics, such as the bandit angelfish and the Hawaiian variant of the flame angel, PIA also has a pair of Chaetodon tinkeri butterflyfish, a pair of Cirrhilabrus earlei wrasse, a pair of Karen Brittain’s famous captive bred Amphiprion latezonatus clownfish, and the icing on the cake, a Dr. Seuss soapfish (Belonoperca pylei). With the exception of the soapfish, all of these rare gems are still listed as available on the PIA website. The soapfish hasn’t been listed as of yet, as the crew at Pacific Island Aquatics wants to take extra precautions with this individual. After all, these odd looking fish usually sell for $4000-5000 per, though we don’t have word yet on what this individual will fetch. 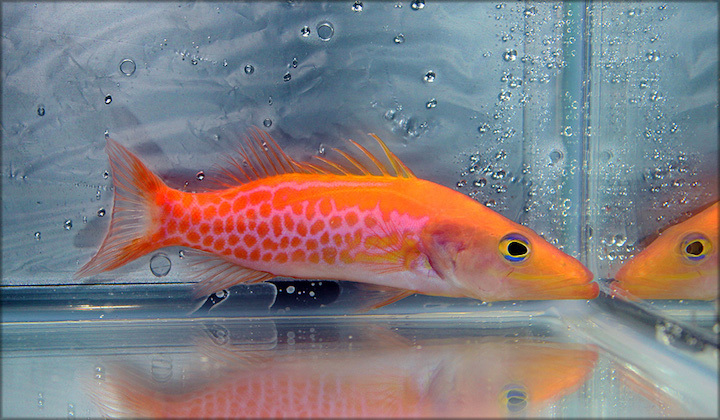 This isn’t the first time that Pacific Island Aquatics has gotten their mitts on one of these extremely rare soapfish. If you recall, they had one last September with a sticker price of $3500. As for the captive bred Latz clowns, these two fish are captive bred from Karen Brittain. For those who don’t know her, Karen is one of the most well respected fish breeders in the hobby, and she flies so far under the radar that you may have never heard of her. That said, we’ve heard rumors that she’s thinning out her broodstock and scaling back on her fish breeding. Karen isn’t exactly easy to get a hold of these days, so we can’t state these claims with too much certainty. Regardless, it’s not often we see fish from her for sale, so it’s an exciting moment for the hobby.